Timo Moisio | I make games. My entry for Ludum Dare 34 in December 2015. The player controls a pilot ship in a storm at night, and guides lost ships to a safe harbor. My team’s entry for Global Game Jam 2015. Made with Unity, mainly targeting Digistar 5 full dome projector at Särkänniemi Planetarium. We Were Here is a single player game depicted as a cave painting, where the player manages a tribe of stone age people who are hunting and gathering food. My contribution in out team of six was design and programming. The Music of Erich Zann, coming soon to Android, iOS, Windows Phone 8 and Windows Store, is a game base on a story by H.P. Lovecraft of the same name. It’s a story about a mute viola player who fight mysterious forces from behind his windows by playing wild tunes with his viola, and if you’re not familiar with the story, don’t worry because the app comes packed with the story as an illustrated audiobook. 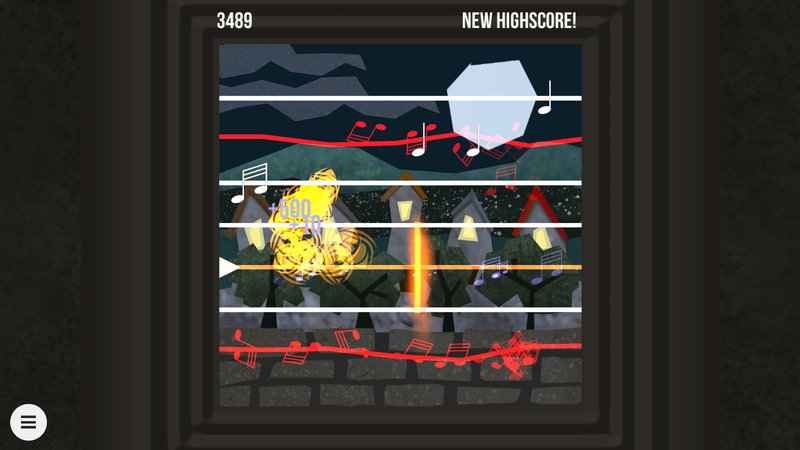 Based on the story, we made a music-driven game where you stop incoming notes and collect powerups by selecting the appropriate horizontal line before they reach the other side of the screen. Miss a note, and the line becomes blocked for a few seconds, and miss an Evil eye symbol, and it’s game over. The gameplay is driven by the soundtrack, reading the pitch and changes in volume, and the player can even supply his own music to play against. Prototypes and test and such, some newer, some older. Simple one level game I made some time ago to test a framework for using a hexagonal grid in Unity. Blast from the past. Video clips from misc projects from 2011-2012. Several of the depicted projects have evaporated as a result of series of unfortunate mishaps. Even this video itself disappeared for a while after what appeared to have been a mistaken or fraudulent copyright claim.